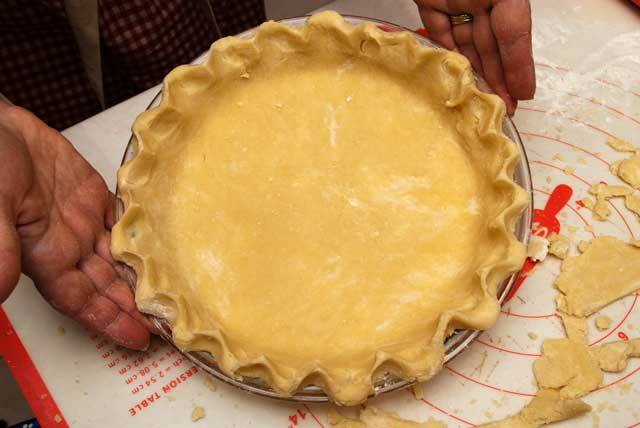 When people talk about making their own pie crust, fear shows in their eyes. Bakers ask how do you make crust flaky, tender and not like a sheet of leather? I think that the biggest problem is the fear itself. Pie crust is not complicated. It consists of four ingredients. With a little practice, anyone can master making it. Also, if it is not to your liking, practice makes perfect. My mother made wonderful pie crusts. They were tender, flaky and delicious. She taught me this skill when I was about twelve. 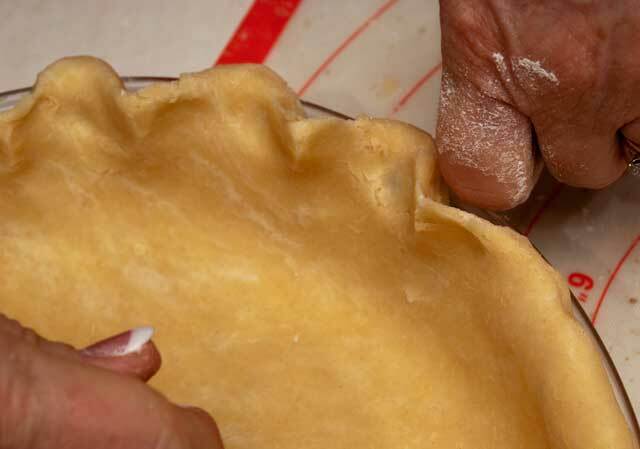 I think because I was young and I didn’t know that others thought making pie crust was impossible, I didn’t attach any emotion to doing what my mother showed me. Every week she would bake a pie. She always said it was for my father who could eat anything and not gain an ounce. He would even top his pie with ice cream. Unfortunately, I didn’t inherit that gene. However, that didn’t prevent me from developing a love for baking. My grandmother made her crust with lard. My mother used a shortening called, Fluffo. 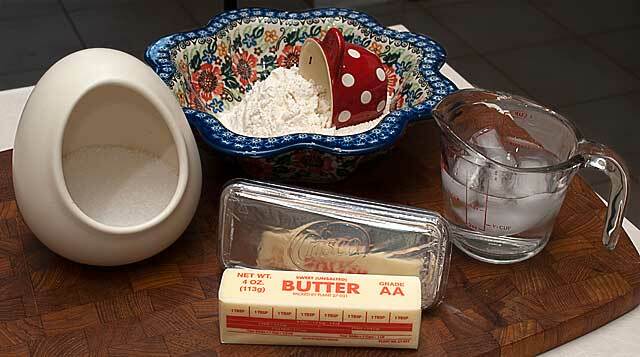 I use a combination of butter and butter flavored Crisco, a shortening. 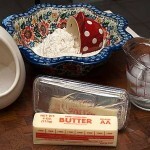 The butter is mainly for taste and the shortening is for tenderness. I learned to combine the flour and shortening with a pastry cutter. I am comfortable with this method so I continue to use it. 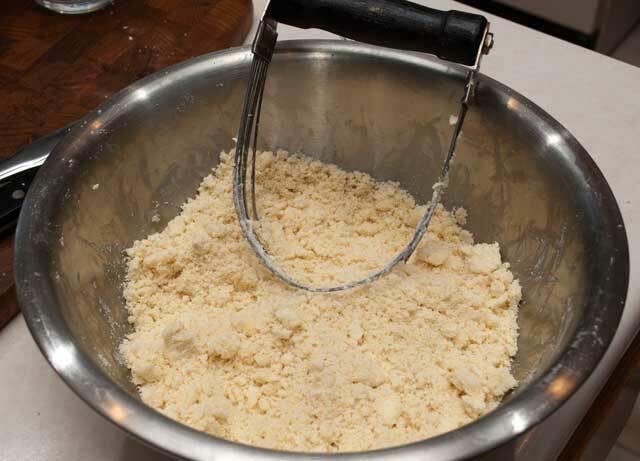 However, you could also use a food processor to cut the butter/shortening into the flour. Using whatever method you choose, cut the butter and shortening into the flour and salt until the shortening is about the size of small peas. Add ice water, a few tablespoons at a time, until the dough just comes together in a ball. Once you add the water, the key is not to handle the dough too much. The more you handle it, the more gluten is developed and this creates a tough crust. Remove the dough from the bowl or food processor and form it into a disk. Wrap in wax paper and chill for at least 30 minutes. Lightly flour your rolling surface and the rolling pin. 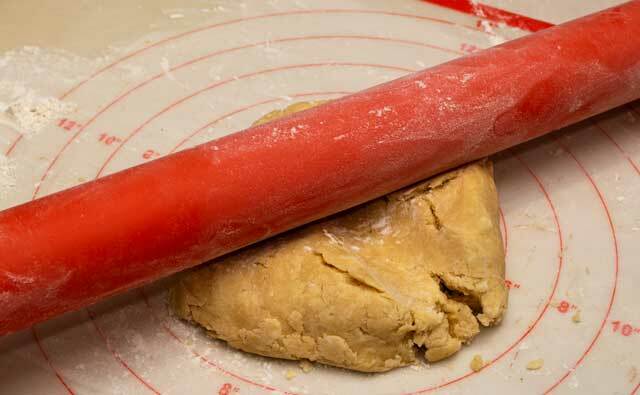 Place the dough on the rolling surface. 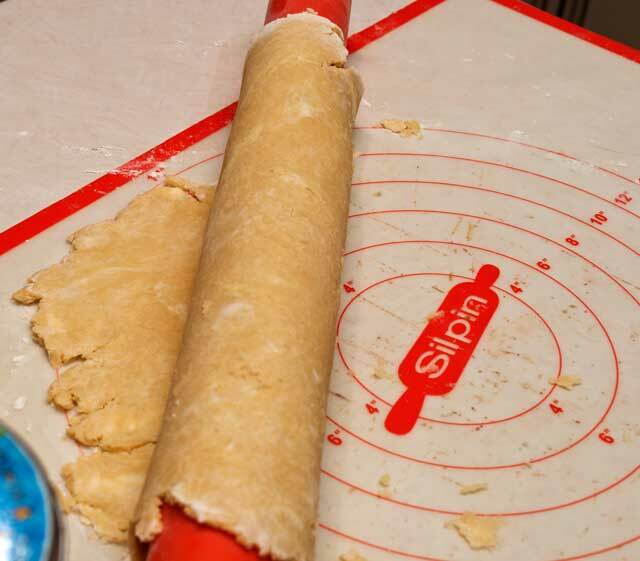 Make an “X” in the dough with the rolling pin. This starts the flattening process. 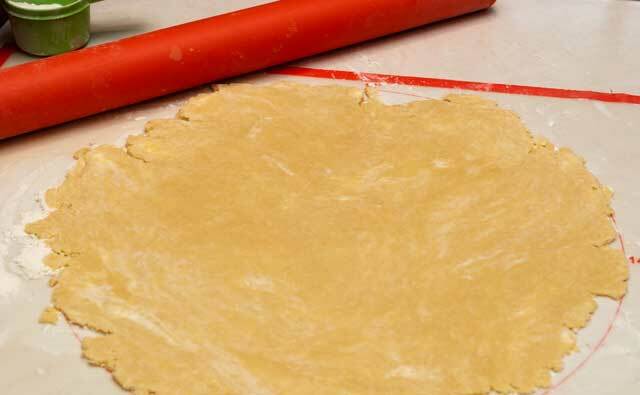 Continue to roll out the dough evenly, turning it frequently to maintain a circle. When the dough is rolled out to the size needed, roll it onto the rolling pin. Lift off the surface and roll it into the pan. If the dough rips, just pinch it back together once it is in the pan. DO NOT REROLL. 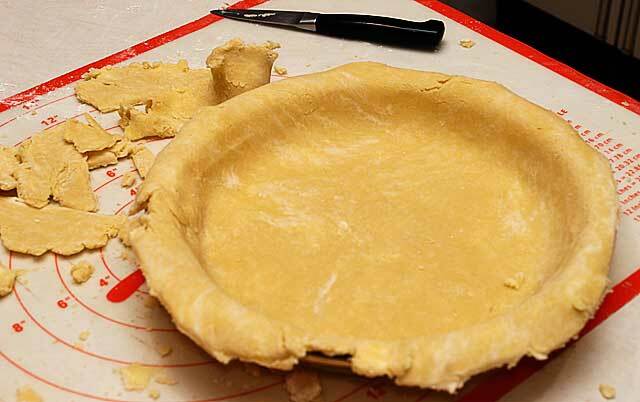 Trim the crust leaving a 1″ overhang. Crimp the edge. Use the forefinger of your left hand and bend it into a knuckle. Place it against the edge of the crust. Using the thumb and forefinger of your right hand push toward your knuckle. You will form a “V” in the edge. Bake and or fill according to your recipe’s directions. 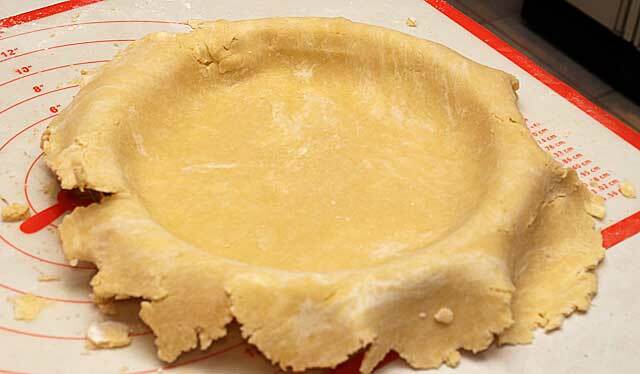 Single crust pie ingredients. For a double crust pie, double the ingredients. Chill making two disks wrapped in waxed paper. Cut the butter and shortening into the flour and salt until the shortening is about the size of small peas. Lightly flour your rolling surface and the rolling pin. Place the dough on the rolling surface. 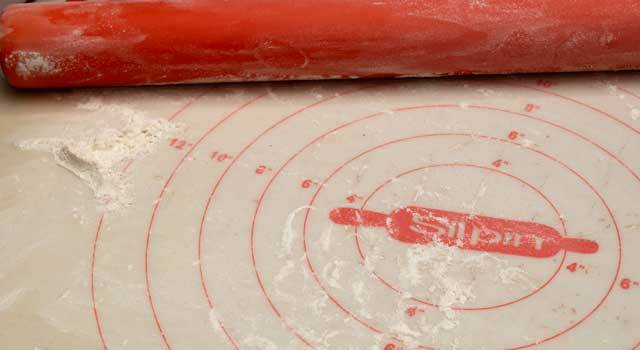 Make an “X” in the dough with the rolling pin. This starts the flattening process. When the dough is rolled out to the size needed, roll it onto the rolling pin. Lift off the surface and roll it into the pan. Trim the crust leaving a 1" overhang. Roll the edge under. Crimp the edge. Use the forefinger of your left hand and bend it into a knuckle. Place it against the edge of the crust. Using the thumb and forefinger of your right hand push toward your knuckle. You will form a "V" in the edge. Bake and or fill according to your recipe's directions. 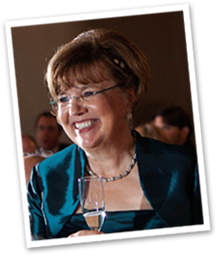 This entry was posted in Desserts, Weekly Tips. Bookmark the permalink.